Is commercial real estate the next shoe to drop? Recent performance of commercial mortgage backed securities indicate a similar path taken by the subprime asset-backed market earlier this year. Based on the latest derivatives which track the performance of commercial markets Markit Group says prices have doubled indicating one of the worst commercial real estate environments since the Great Depression. The seven-year rally in offices and retail properties ended in September when prices fell an average of 1.2 percent, according to Moody’s Investors Service. Banks worldwide are holding $54 billion of unsold commercial mortgages, according to data compiled by New York-based Citigroup Inc. that includes fixed and floating-rate debt. Lenders are struggling to sell loans to investors after losses on debt backed by subprime mortgages to people with poor credit caused financial markets to seize up in July and August. Bonds with AAA ratings secured by properties ranging from the Sears Tower in Chicago to trailer parks in Delaware yield about 203 basis points more than similar maturity Treasuries, up from 92 basis points on Oct. 12, according to Morgan Stanley indexes. Evidently the appetite for this type of paper has evaporated. So much for excess liquidity. More than 75 have been withdrawn because banks aren’t lending, and that estimate is “probably conservative, because not all deals that blew up were well-publicized,” White said. Over 80% of commercial mortgages are interest-only. Unlike the residential bubble most of the 2004-2006 vintages were non recourse loans, i.e. heads the borrower wins, tails the lender loses. After bingeing on cheap credit a la the Greenspan/Bernanke Fed from 2002-2007, lenders are paying the piper for lavishing funds on marginal homebuyers, corporate acquirers, and speculators in the financial markets, commodities and commercial real estate. The inevitable bust is well under way, with nearly all cylinders firing, and still in the early innings. The 128-member Bloomberg REIT Index returned 78 percent with dividends in the two years prior to its Feb. 8 peak, the day before New York-based Blackstone Group LP bought Equity Office Properties Trust for $23 billion, or $39 billion including debt, the real estate industry’s biggest leveraged buyout. Since then, the index has fallen 16.5 percent after dividends as commercial mortgage rates climbed as much as 2 percentage points above the 10-year Treasury note. The last time the REIT index declined more than 10 percent in total return was in 1998 when investors were diverting funds to high-flying Internet stocks. 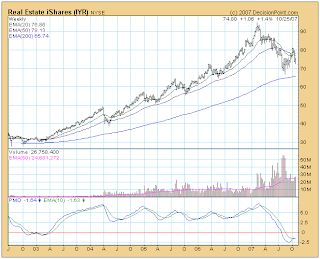 REITs outside the U.S. also declined. The 40-company Tokyo Stock Exchange REIT Index, led by Nippon Building Fund Inc. and Japan Real Estate Investment Corp., is down 28 percent from its high last May. The 14-member Bloomberg Europe Real Estate Index, led by Unibail-Rodamco SA, is down 33 percent from its February peak. The U.S. office vacancy rate increased to 9.8 percent at the end of September from 9.7 percent in the second quarter, and rents in Manhattan and San Francisco climbed at the slowest pace in more than a year in the third quarter, according to real estate brokers Cushman & Wakefield Inc. and Studley Inc. in New York and Chicago-based Grubb & Ellis Co.
Takeovers fell 72 percent in the third quarter from the prior quarter, data compiled by Bloomberg show. While the pace of deals slowed, the value of U.S. REIT acquisitions totaled $59 billion in 2007, up from $7 billion in 2005, according to New York-based industry research firm Real Capital Analytics Inc. This year’s transactions include the buyout of Chicago- based Equity Office; the $22.2 billion purchase of apartment REIT Archstone-Smith Trust of Englewood, Colorado, by Tishman Speyer Properties LP and Lehman Brothers Holdings Inc.; and Morgan Stanley’s $6.5 billion takeover of Crescent Real Estate Equities Co., the Fort Worth, Texas-based office, residential and resort REIT. Interesting how Wall Street – Blackstone, Lehman, and Morgan Stanley – bought at the top. Shades of buying subprime lenders a year ago? If commercial real estate is going down the same path as residential, the banks are in serious trouble.